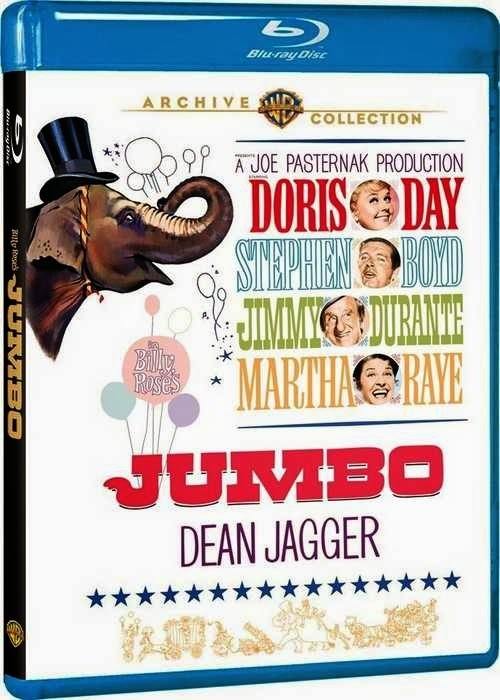 Rupert Pupkin Speaks: My Warner Archive Grab Bag: Billy Rose's JUMBO On Blu-ray, THE SPIRIT and THE CABBAGE PATCH KIDS ""
After a short hiatus, Warner Archive brings us another lovely Blu-ray Disc. Has an overture they sets the mood well - very festive and circus-y. Truly an epic musical with a run time of over two hours. What fascinates as much as the film is the stage production it is based on. It used to be performed at the legendary Hippodrome in New York City, a venue they took up basically a full city block and could seat 5,300 people. They could actually have a full circus(with animals) on the stage along with a giant rising water tank. The Hippodrome sounds like it was quite the magnificent show palace. Sadly it closed in 1939 about 4 years after JUMBO debuted there. 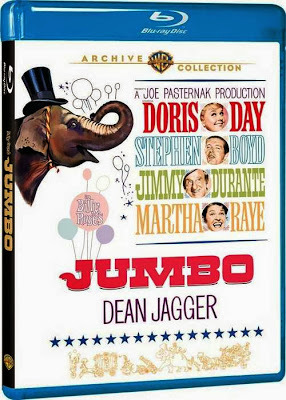 JUMBO the film is a unique musical in that it offers not only the standard lavish, colorful MGM sets and songs, but also lots circus related thrills including acrobatics and animal acts. Busby Berkeley even choreographed some of the set pieces, which are always a sight to behold. The whole package makes for a nice spectacle becoming of 'the greatest show on the face of the earth' talk that comes up during the movie a few times. Doris Day is the good-hearted daughter of circus owner/chronic gambler Jimmy Durante. Day is her usual charming self even if her romantic subplot with the uncharismatic Stephen Boyd(THE BEST OF EVERYTHING) is tepid at best. "What is he some kind of pervert?" "No, he's not a pervert, that's The Spirit!" 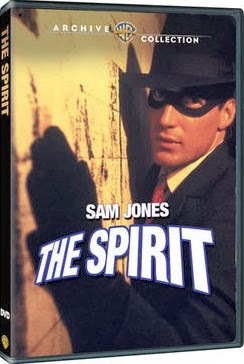 THE SPIRIT is an interesting companion piece to Sam J. Jones' most remembered role as Flash Gordon in the classic 1980 film. Here, Jones plays Denny Colt, a red blooded cop from Oregon who gets himself "killed" whilst trying to hunt down his best friend's(Phillip Baker Hall) killer. Denny is almost Adam West-Ian in his view of the law and justice so that's what I find most comparable between him and the character of Flash Gordon. Not that Flash was quite so righteous, but they both represent a certain kind of old fashioned Americana to me. That being said, THE SPIRIT still feels more like a TV pilot whereas FLASH feels like a movie(then again, having a Queen score would elevate any material). Jones is affable here though, especially when he dons the titular costume. There's even a nice 1980s 'cleanin' up crime' montage with spinning newspaper headlines and hot guitar licks about a third of the way in. Good times. In fact, the whole score would made for a great soundtrack to standalone Sam J. Jones workout video! The opening of this special very much echoes the beginning of DUMBO - with a stork flying over the U.S. with each state labeled clearly from above. The stork descends on Georgia as he lays out the history of The Cabbage Patch Kids. There's also some Wind in The Willows mixed in here too in the form of an evil Weasel henchman for the mean old lady villain who wants the kids to crawl into a mine to get gold for her. 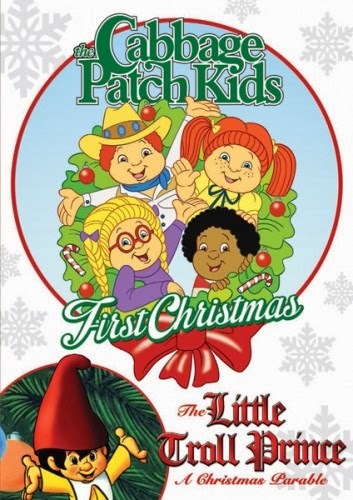 The 'Patch Kids slyly escape the old witchy lady end up sneaking into the city in a Christmas tree truck, in search of "the Christmas Spirit", which they inevitably learn the meaning of by movie's end. It's hard to talk about this special without talking a little bit about the Cabbage Patch Kids phenomenon of the 1980s. Having lived through it and having had two sisters, I can honestly say it was like nothing of ever heard of before. Nowadays, we are somewhat accustomed to there being high demand for certain toys and game systems, but back then, (pre-internet obviously) it was pretty outrageous to have such a run on one single toy. It seemed to come out if nowhere. Suddenly my sisters had to have one if these dolls. How my mom found one I'll never know as they were sold out all over town during the Christmas season. I wish I could remember how they marketed them because however it was done it was some kind of a miracle campaign. Anyway, I find some odd curiosity in the media outcroppings from such phenomenon. It's always interesting on some level for me to see what the creative folks at the time came up with in terms of stories for these toys or fads to inhabit. This one certainly feels a bit rushed, but it may still have some enjoyability for youngsters even today, almost 30 years later.